"...a near standing-room-only crowd attending the funeral of Preston "Pug" Harris, a Hunt County native, who was killed on Nov. 22, 1944, during a battle in Beeck, Germany..."
Preston "Pug" Harris, WWII era photo. The Soldiers of the Fourth Infantry Division out of Fort Hood in Kileen Texas stand at attention after loading the casket of Private First Class Preston Harris in to the hearse at Peters Funeral Home Saturday afternoon. Harris was interred at Van Sickle Cemetery. 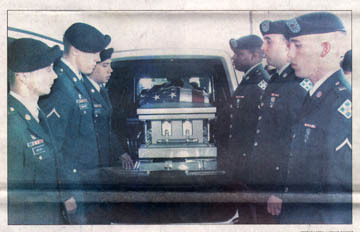 When U.S. Army Chaplain Ladislao Hernandez was notified he would be going to Greenville to conduct a funeral service for a war casualty, the Fort Hood soldier assumed it would be for someone killed in Iraq. "When they told me it was from World War II, I thought "Wow. that is amazing. That is awesome," said Hernandez. "I felt so privileged ... I said, 'Thank you God for this experience.'" Hernandez spoke to a near standing-room-only crowd attending the funeral of Preston "Pug" Harris, a Hunt County native, who was killed on Nov. 22, 1944, during a battle in Beeck, Germany. He was buried in an unmarked grave. Chaplin Ladislao Hernandez talks about the bravery it took to be a soldier in World War II as he conducts the service Saturday for Preston Harris, who was being buried "back home" after 60 years in an unmarked grave in Germany. Chaplain Ladislao Hernandez talks about the bravery it took to be a soldier in World War II as he conducts the service Saturday for Preston Harris, who was being buried "back home" after, 60 years in an unmarked grave in Germany. Harris's remains were unearthed in 2003 while a construction company clearing land mines for a development project. Part of a jeep set off the detectors and while it was being excavated, Harris's remains were discovered. A set of dog tags helped lead to the discovery of his identity and this past week he was brought home to Texas and his final resting place in the old Van Sickle Cemetery. Hernandez, a native of Puerto Rico, is on active duty at Fort Hood and is scheduled for a year of duty in Iraq. He has already served one year there and told those who filled Peters Funeral Home chapel that serving in war left him awed at what the soldiers in World War II faced. "We have so much equipment nowto protect us. Pvt. Harris and the other soldiers were so brave." Hernandez said after receiving his assignment he researched the circumstances surrounding Harris' death. According to records, Harris was part of the 405th Infantry Regiment, 102nd Infantry Division that was fighting along the heavily fortified Siegried Line near the German-Netherlands border. The troops went on to triumph in that campaign, though Harris had already been killed, presumably in a foxhole with others, Hernandez said. Many survivors attended the service including Harris's 89-year-old sister Maple Harris Hudson and his 2-year-old great-great niece, Abigail Jean Hudson, who slept on her father's shoulder after having sung along with the patriotic music that was part of the service. Doyle Hudson, a nephew of Harris, said the family was appreciative of the support from the military in returning his uncle's body to Hunt County. "It says a lot for the Army," Hudson said. "They could have easily just swept the whole thing under the rug when the remains were found. Instead, they've done everything they could to bring him home." Transportation cost was, borne by the government while Peters Funeral Home absorbed costs of the services. Abigail Jean Hudson, 2, sleeps on the shoulder of her father Craig Hudson, after having sung along with all the patriotic music, played during her great-great uncle's funeral Saturday. 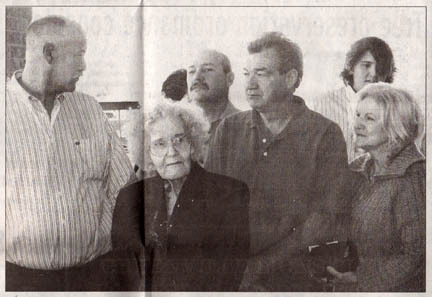 She was the youngest member of the family present with Maple Harris Hudson, right center, sister of Preston Harris,was the oldest at 89. Also pictured is Doyle Hudson and other members of the family. At left, Otho Morgan American Legion Post members Jack Elder, his wife Christy Elder and David Harvey of Greenville wait outside of the funeral home before services for Preston Harris. U.S. Army officer Sean Lovett was at the funeral Saturday, assigned from Fort flood to help the family with paperwork and to help coordinate the event. "I feel relieved myself that we were able to bring this soldier home," Lovett said. "My great uncle was killed in Italy in 1943 or 1944 and I'm not sure they ever found him. The Army is always looking to get these men home. We're obligated to find them because they made the ultimate sacrifice. It is a moral and ethical responsibility." 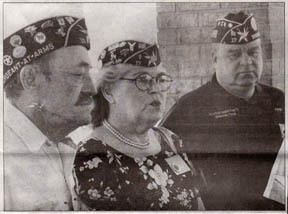 Several members of local arm of the American Legion were present to honor the memory of Harris. They all wore'POW/MIA ribbons. "It is day of loss, but also a day of joy," said Christy Elder. "The thing to remember is that there are still more than 3,000 missing." Her husband Jack Elder, who served in Vietnam, had similar thoughts. "It is a proud day for veterans and a proud day for our country," he said. Also in the crowd were a contingent of National Guard reserve officers and representatives of the Audie Murphy/American Cotton Museum who spearheaded the War Memorial at the museum grounds which lists Harris's name on the World War II panel as having been killed in action. Herald-Banner, Sunday, March 13, 2005, pp. A1 and A6. Newspaper article submitted and used with permission by Mr. Day Davis of Campbell, TX. 16 April 2005: Follow up to this interesting story. A couple of days after receiving this mailing from Mr. Day Davis, I received the latest edition of the Ozark Notes. Contained within the newest news letter of the 102n Division Association was an article entitled: Remember Beeck, written by T/Sgt. Byron W. Riggan, 405-E. Mr. Riggan was a squad leader of twelve men. One of the men in his squad was Preston "Pug" Harris! The article deals with the disasterous attack by the 405th on Beeck, Germany in November of 1944. The article also mentions Mr. Preston Harris by name! and it is most interesting that both stories surfaced at the same time! You can read the article Remembering Beeck by Byron W. Riggan by clicking on the link. 26 April 2005: Follow up to this interesting story. We have received a second newspaper article dealing with the "Coming Home" of PFC. Preston "Pug" Harris. This article ran in the San Antonio Express News on March 4, 2005. FORT WORTH &emdash; A military funeral is planned next week for Pfc. Preston "Pug" Harris, a World War II soldier whose remains were discovered recently and returned to Texas. In 1944, the 23-year-old soldier from Greenville was part of the 405th Infantry Regiment, 102nd Infantry Division that was fighting along the heavily fortified Siegfried Line near the German-Netherlands border. Records show that Harris was killed Nov. 22, 1944, near Beeck, Germany. Harris officially was listed as killed in action, but the location of his body was unknown. The family was told that he might have been buried in an unmarked grave at a military cemetery in the Netherlands. In June 2003, a German company removing unexploded ordnance from the battlefield uncovered human remains in an unmarked grave. The personal items found &emdash; a shaving brush, parts of a comb and boot, a worn set of dog tags &emdash; led officials to believe the remains were that of a U.S. soldier. The remains were transferred to the Hurtgen War Cemetery and later to the U.S. Army Mortuary Affairs Activity in Landstuhl, Germany. A team from the Joint POW/MIA Accounting Command at Hickam AFB in Hawaii went to the Beeck area last summer and excavated the site, said Harris' nephew, Knighton Hudson, 50, of Wylie. Investigators used dental and medical records to identify Harris. A military representative later visited Harris' family and returned some of the personal items. Harris' military funeral is scheduled for March 12 in Greenville. Harris was the youngest of 10 children. The only surviving family member is his 89-year-old sister, Maple Harris Hudson, who is still coming to terms with the discovery, said her son. "I think more than anything she was heartened that she was able to fulfill her mother's wishes to bring him home," Knighton Hudson said. "I really don't think it's hit her yet." Through the years, the old photographs and letters from Harris have been lost. Only an old photograph from a local history book shows him in his Army uniform. Knighton Hudson said that as a child, he heard that his uncle loved horses and was fond of smoking a corncob pipe. "He was a farmer from a whole family of farmers," he said. "As far as I know, his aspiration was to come back home and be a farmer. That was what he wanted to do." 27 April 2005: Follow up to this interesting story. We have received a third newspaper article dealing with the "Coming Home" of PFC. Preston "Pug" Harris. A piece of a comb. A worn set of dogtags*. These clues helped solve a 60-year-old mystery about the whereabouts of Pfc. Preston "Pug" Harris. In November 1944, the 23-year-old soldier from Greenville was part of the 405th Infantry Regiment, 102nd Infantry Division that was fighting along the heavily fortified Siegfried Line near the German-Netherlands border. 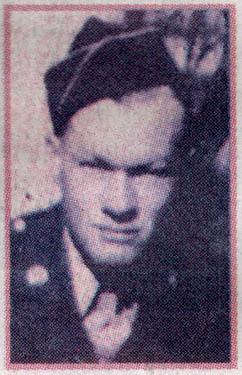 The regiment's records state that Harris was killed Nov. 22, 1944, near Beeck, Germany. He was eight days short of his 24th birthday. Harris was officially listed as killed in action, but the location of his body was unknown. His family knew little else. "One of my other uncles wrote one of the men in Preston's unit who said they were in a field when an 88 [mm] round came in on him and the other guy and that was it," said Harris' nephew, Knighton Hudson, 50, of Wylie. The first step toward solving the mystery occurred in June 2003 when a German company that was removing unexploded ordnance from the battlefield uncovered human remains in an unmarked grave. The personal items found in the grave led officials to believe they had discovered a U.S. soldier's remains. The remains were transferred to the Hurtgen War Cemetery and later to the U.S. Army Mortuary Affairs Activity in Landstuhl, Germany. A team from the Joint POW/MIA Accounting Command at Hickam Air Force Base in Hawaii came to the Beeck area in June, excavated the site and took control of the remains, Hudson said. After examining dental and medical records, the investigators were able to identify Harris. A military representative visited Harris' family in February and returned some of the personal items that had been recovered. Bob Mason, general manager of Peters Funeral Home in Greenville, said his staff did a double-take when they first learned the date of Harris' death. "It was a very interesting thing when we started talking about a death that occurred on Nov. 22, 1944," Mason said. But the service won't include a ceremonial rifle volley. "My grandmother didn't want that," Hudson said. "She felt like he already had enough shooting over there." Harris was the youngest of 10 children. The only surviving family member is his 89-year-old sister, Maple Harris Hudson. Knighton Hudson said his mother is still coming to terms with the discovery of her brother's remains. "She was kind of in shock," Knighton Hudson said. "She basically figured for the last 60 years that he was buried somewhere over there and then all of the sudden, she finds out he's been found. 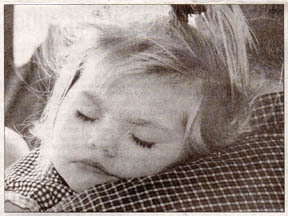 "I think more than anything she was heartened that she was able to fulfill her mother's wishes to bring him home. I really don't think it's hit her yet." Knighton Hudson said that as a child he heard that his uncle loved horses and was fond of smoking a corncob pipe. "He was a farmer from a whole family of farmers," Knighton Hudson said. "As far as I know, his aspiration was to come back home and be a farmer. That was what he wanted to do." *(Webmaster note): According to a phone conversation Mr. Knighton Hudson, nephew to the late Preston "Pug" Harris, conducted on the evening of 27 April 2005, only a SINGLE dog tag was found at the recovery site. Other details also provided by Mr. Hudson. Location where the remains of Preston "Pug" Harris were located. The stake marks the location. Location where the remains of Preston "Pug" Harris were found. 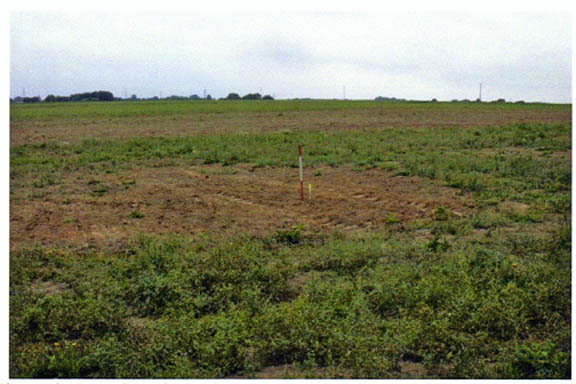 The small red circle, south of Beeck, Germany marks the location where the recovery process took place. The above story, "Coming Home", a newspaper article which ran in the Herald-Banner on Sunday, March 13, 2005, on pp. A1 and A6 was reprinted with permission from the contributor, Mr. Day Davis of Campbell, Texas. Staff photos are credited to Cerone Lacy/Herald-Banner. Original Story submitted on 4 April 2005. 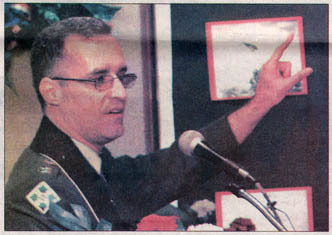 Story added to website on 11 April 2005.